Create a project schedule in Excel with an easy-to-use template. Simply enter your tasks and start and end dates - no formulas required. 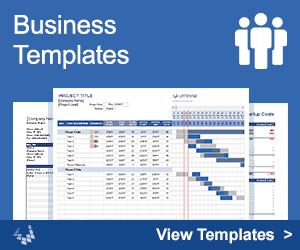 This template uses conditional formatting to generate a Gantt chart like our original Gantt Chart Template, but it has you enter start and end dates instead of start date and duration, and it doesn't require you to copy any formulas. You can add formulas if you want to calculate duration or create task dependencies, and you can read below to learn how to do that, but the point of this design was to keep things as basic as possible. License: See the Private Use License (not for distribution or resale). This template has been licensed to Microsoft for distribution via their apps and template gallery. A Gantt chart is a tool for project management developed by Henry Gantt in the early 1900s. 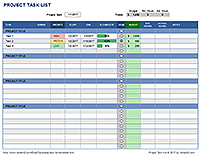 It uses horizontal bars to show the periods of time when each task or resource has been scheduled. It may also show the portion of work completed, task dependencies, milestones, and other data. A vast number of software applications have been developed for project management, and most of these use a Gantt chart to visualize the project schedule. However, if you don't need all the bells and whistles of these applications, a spreadsheet can be a simple solution. Although the spreadsheet is compatible with multiple versions of Excel, the following instructions are based on using Excel 2016. When you insert new tasks, you should first insert a blank row and then enter the task and dates. Right-click on the row number and select Insert. If you do this, the formatting will be copied automatically from the row above. NOTE You can also copy a row and then insert the copied row, but Excel doesn't automatically merge conditional formatting rules when you do this, resulting in fractured conditional format rules. Go to excel.uservoice.com to Vote on This Suggestion if you would like to encourage Microsoft to fix this problem. You can edit the Display Week number to change the period of time displayed in the Gantt Chart. Week 1 is the week containing the Project Start Date. Incrementing the display week number has the effect of scrolling the gantt chart 1 week at a time. HINT Add a Scroll Bar! If you are using Excel 2007/2010/2013/2016, you can add a scroll bar form control to the header and link the form control to the cell containing the Display Week number, just as in the original Gantt Chart Template. To increase the time span displayed in the spreadsheet, add columns to the right of the Gantt chart by copying and pasting groups of 7 columns (because the column labels on row 4 are merged cells). How do I print my entire project schedule? This template is set up to display 1 day per column. If your project covers a longer period of time (many months), and you don't want to add more columns to the chart, you would need to change the way the columns are labeled to display time increments of weeks or months (not a simple thing to do on your own). 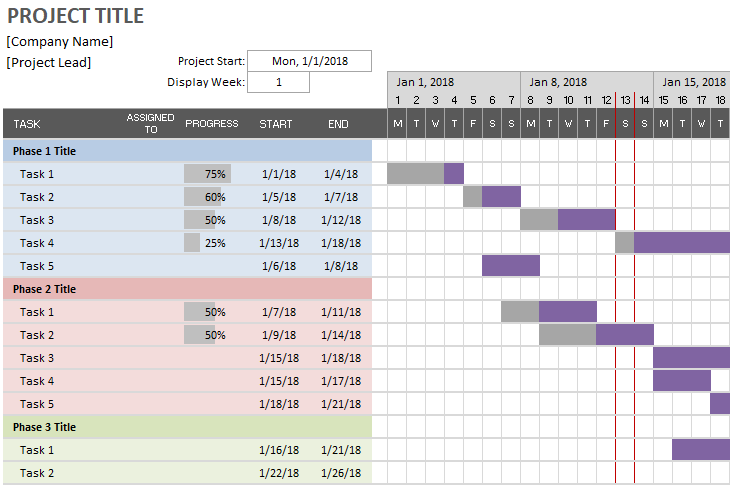 If your project spans many months and you don't need or want to display a daily view, you can try the free Construction Schedule template. If you want the ability to change the view from daily to weekly or monthly, check out Gantt Chart Template Pro. If you want to edit the bar color used in the Gantt chart, you will need to edit the conditional formatting rules. Go to Home > Conditional Formatting > Manage Rules and select "This Worksheet" to see and edit all the rules. Gantt Chart Template Pro allows you to change the bar color for individual tasks by entering a color code (like "g" for green) in a separate column. The free Construction Schedule template also uses that technique. In this template, column H is hidden by default, but contains a column for calculating the task duration in Days. You can unhide column H, or you can insert your own columns to enter your own formulas. In this template, task_end and task_start are named ranges that use relative references to refer to the values in the Start Date and End Date columns. You can use these named ranges or you can enter the formula using regular cell references such as =F8-E8+1. If you want to display the number of work days between two dates, not counting weekends, then you can use the NETWORKDAYS function that is built into Excel. The NETWORKDAYS function assumes the non-work days are Saturday and Sunday. To define which days of the week are non-work days, see the Excel help on the function NETWORKDAYS.INTL. When setting up a project schedule, you may want to use formulas to link dependent tasks so that if you change the start date, the dependent tasks will also change. A simple way to create a dependent task in this template is to use a formula for the start task such as =end_date+1 where "end_date" is a reference to the end date of the predecessor task (so the formula might look like =F8+1. You may want to use a row to summarize the total duration and progress of the project, or you may want to summarize a set of sub-tasks. The following formulas can be used in the Start, End, and Progress columns to summarize a subset of tasks. Replace start_dates and end_dates with the appropriate range references.